1 medium lemon contains 20 calories and 5 g of dietary fiber. 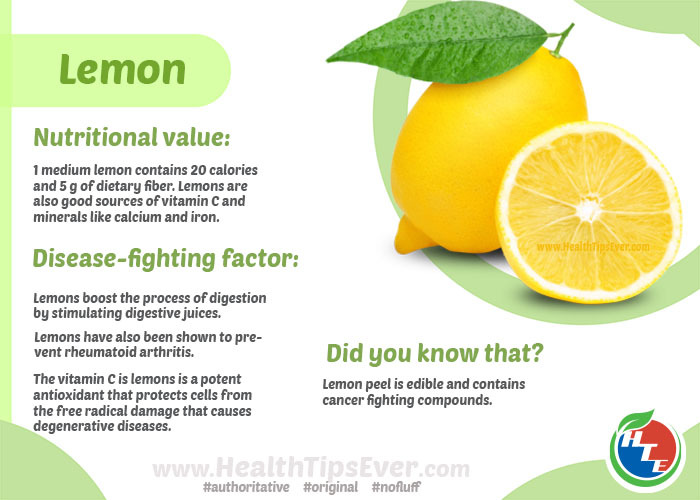 Lemons are also good sources of vitamin C and minerals like calcium and iron. Lemons boost the process of digestion by stimulating digestive juices. Lemons have also been shown to prevent rheumatoid arthritis. The vitamin C in lemons is a potent antioxidant that protects cells from the free radical damage that causes degenerative diseases. Lemon peel is edible and contains cancer fighting compounds.